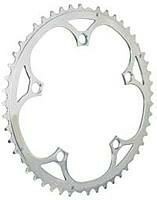 The Nerius 110sc chainring has a specific PCD for Campagnolo cranksets. Completely CNC machined. Compatible with 9/10 speed. • PCD : 110sc mm. • Inner : 38 teeth.